We covered Abraham Lincoln's childhood in Indiana in the Spring 2015 issue and Jefferson Davis in Kentucky (his birthplace) in the Spring 2017 issue, so it seemed appropriate to travel to Abraham Lincoln's birthplace and see if there really is a log cabin there. We did and there is. 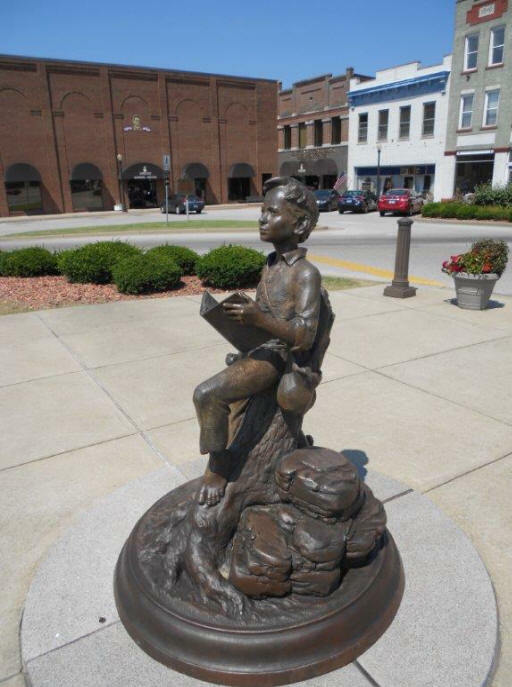 The location is a National Historical Park near Hodgenville, Kentucky, about 65 miles south of Louisville. Yes, there was a cabin. Thomas Lincoln and Nancy Hanks married in 1806 and settled in Elizabethtown, Kentucky where they had their first child, Sarah, in 1807. In 1808 they moved to Sinking Spring Farm on the south fork of Nolin Creek, a few miles south of Hodgenville. They paid $200 for a 300 acre farm. Their new home was a cabin, approximately 16 feet by 18 feet in size, constructed with about 143 oak and chestnut logs. It had a stone fireplace, one door and one window, wooden shingle roof, and a dirt floor. They were expecting a second child. Symbolic birth cabin of Abraham Lincoln, inside first Lincoln Memorial. 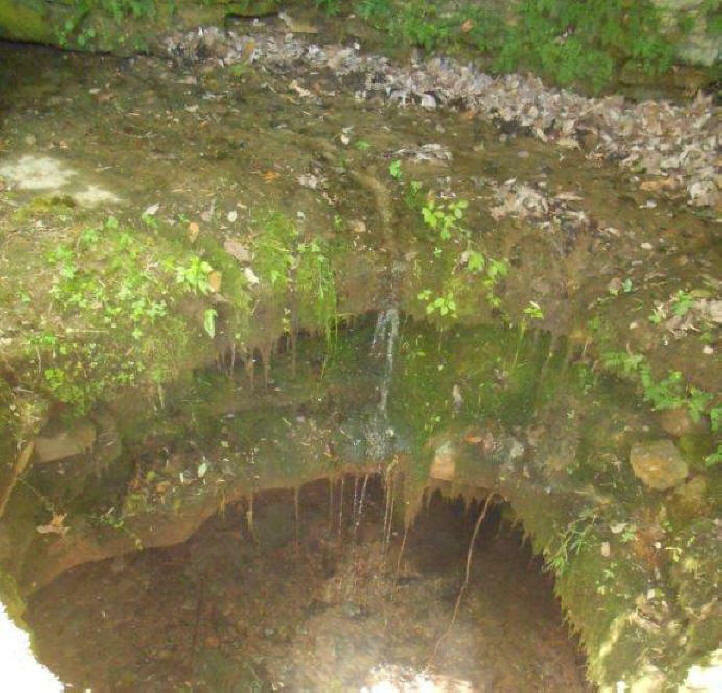 The farm was named for a spring that supplied water on the property; it was located in a deep cave and is still there today, just below the hill on which Lincoln was born. The spring was likely an important factor determining the location of the cabin. Abraham Lincoln's first taste of water must have come from that spring. 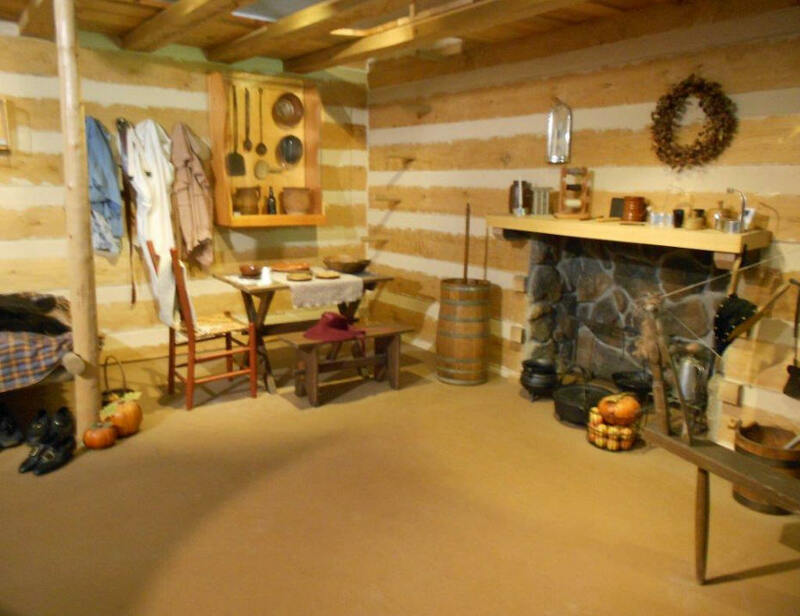 On February 12, 1809, Nancy Hanks, lying on a bed of cornhusks and bearskin, gave birth to a son in that cabin. He was named Abraham, after his grandfather. Due to problems with the land title, the family was forced to move from the farm two years later. Abraham Lincoln later wrote that his first memories did not include the Sinking Spring Farm. During that two years a young oak sapling grew near the cabin. It was called the Boundary Oak and survived until 1976. Its location is on the park's map. In 1811, the Lincoln family moved a short distance east of Hodgenville to a farm on Knob Creek, where the soil was more fertile. In his 1860 campaign biography he wrote: "My earliest recollection, however, is of the Knob Creek place." Those recollections included planting pumpkin seeds in the creek's bottomlands, only to see them washed away by a flash flood; falling into Knob Creek and almost drowning before being saved by a friend, Austin Gollaher; and of his younger brother, Thomas dying of an unknown disease and being buried nearby. He and his sister Sarah walked two miles to a small school. This is also where Lincoln first witnessed the cruelty of slavery. The family eventually moved to Indiana in 1816, due to further land title problems and "partly on account of slavery." 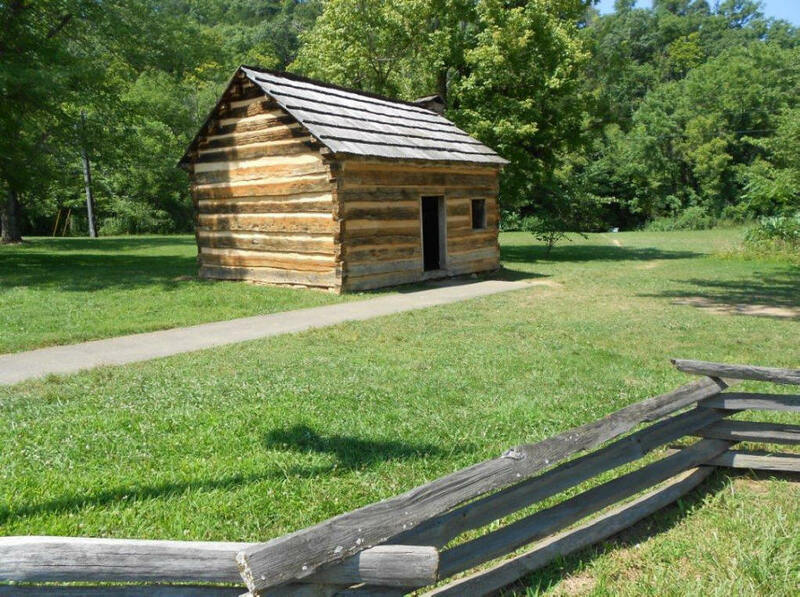 Boyhood cabin of Abraham Lincoln, Knob Creek farm. The National Historical Park includes two units, about ten miles apart: Sinking Spring Farm and the boyhood home at Knob Creek. The Sinking Spring Farm unit has the birthplace, memorial building (with cabin), Sinking Spring, site of the Boundary Oak, and a visitor center. 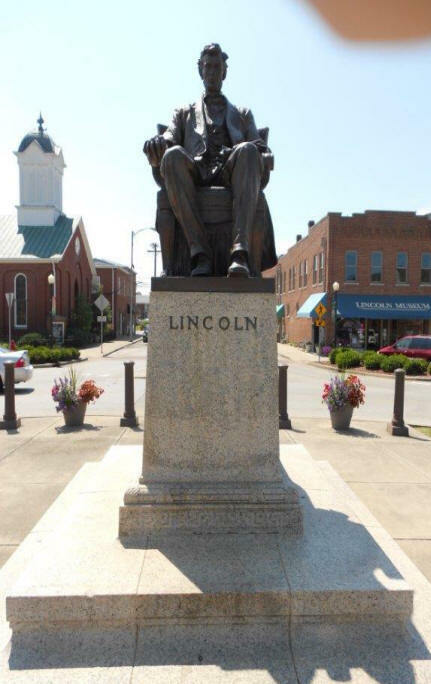 In Hodgenville, between the two sites, on the square, are a young Lincoln and an old Lincoln. The older Lincoln. The first Lincoln Memorial was constructed on a knoll above Sinking Spring, the most likely location of the original Lincoln cabin. It was built between 1909 and 1911 in an ancient Greek and Roman architectural form using Connecticut granite and Tennessee marble. Theodore Roosevelt laid the cornerstone. Symbolism is not difficult to notice within the memorial: fifty-six steps lead up to the memorial, representing the years of Lincoln's life; there are sixteen windows and the interior ceiling has sixteen rosettes to remind visitors that Lincoln was the sixteenth president; and the center of the memorial contains the symbolic birth cabin of Abraham Lincoln on the site of the birth. It is called a "symbolic" cabin as it is not the actual cabin, but one that was nearby on the property. It is what the original cabin would have looked like. Sinking Spring is still at the bottom of the knoll, down the fifty-six steps. It got its name from dropping into a pit and disappearing into the earth. It is cave-like, what you would expect in this part of Kentucky. Sinking Spring below the Lincoln Memorial, far below the ground. The Lincoln family lived on about thirty acres of the Knob Creek Farm until the time Abraham Lincoln was almost eight years old. The fields are still there and another cabin. Knob Creek is just a short walk. Visitor center view of what inside of Lincoln cabin might have looked like. It is a very interesting historical site. 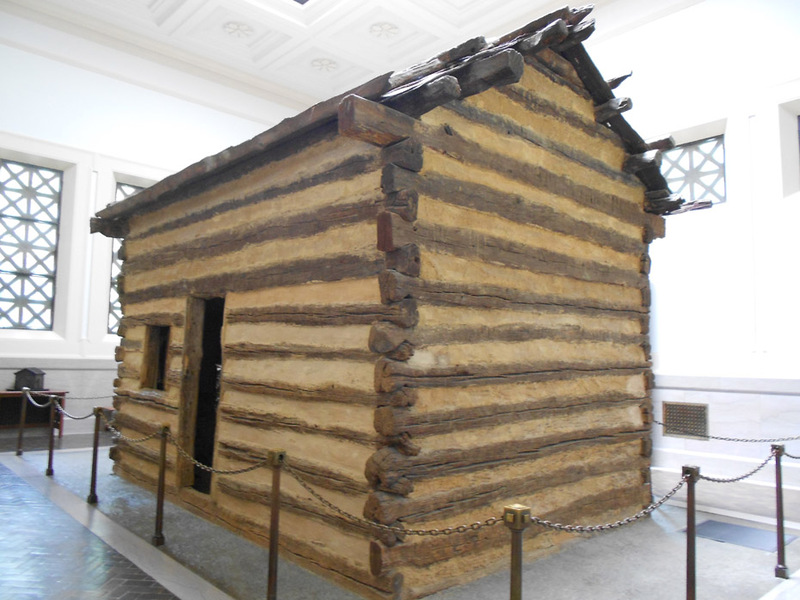 Americans tend to know about Lincoln's log cabin. It is something to actually see it, if only symbolically. The two farms themselves give much insight into what Lincoln's early life must have been like. 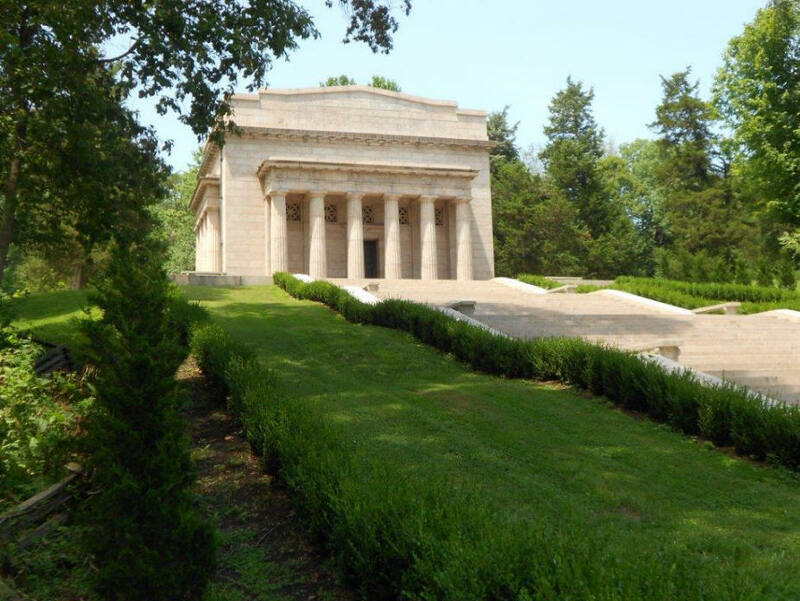 Combined with the Lincoln Boyhood National Memorial in Indiana (about 110 miles northwest by road), these National Park sites provide a fascinating overview of Abraham Lincoln's early life.